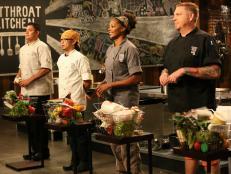 Jeremiah Alley, 2014, Television Food Network, G.P. All Rights Reserved. Alton reveals the sabotages for meatballs, fish and chips and candy. 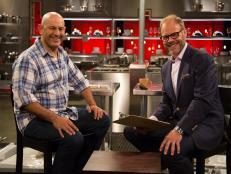 Not just a competition, Cutthroat Kitchen is a game, and to win, chefs must be able to not only outcook their contestants but also outthink them, both during auction and in the midst of their food prep. During tonight's finale heat of Superstar Sabotage, Chef Marcel Vigneron proved just how useful it is to be a savvy contestant — one that can anticipate the judging process and use it to his advantage. In Round 1's meatball challenge, Marcel was forced to make the star of his dish with either canned soup or canned ham, and he opted for the ham, a seemingly doozy of an ingredient but perhaps ultimately his saving grace. 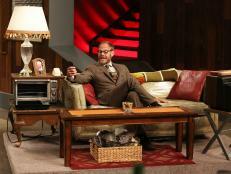 "It freaking tastes good," host Alton Brown revealed on his After-Show. "It's salty, so it's got those spices." 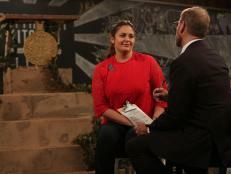 Judge Simon Majumdar agreed, explaining that while the salt of such a canned product has the potential to be overwhelming, Marcel used the "competition smarts" to use that flavor to his benefit. "He knew that I was only going to take a taste, mix it with the other things on the plate and then make my decision based on that," Simon said. "It's not like I was going to chow down on the whole big meatball." Click the play button on the video above to hear more from Simon and Alton and find out who won the first-ever Superstar Sabotage tournament. 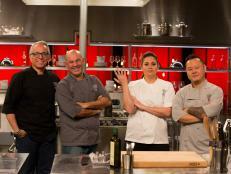 Don't miss a new episode of Cutthroat Kitchen on Sunday at 10|9c. Even in the midst of downright diabolical sabotages, one Cutthroat Kitchen competitor managed to be his own worst enemy. 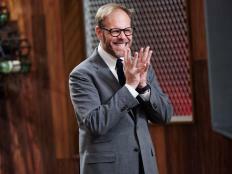 Watch the eleventh episode of Cutthroat Kitchen: Alton's After-Show, hosted by Food Network's Alton Brown. 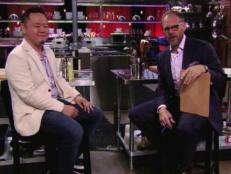 Watch the fifth episode of Cutthroat Kitchen: Alton's After-Show, hosted by Food Network's Alton Brown.